With “mavens” Marlene Beltrán-Cuauhtin and Marisa Martínez on vocals, Tony “Tone-Irie” Sauza on vocals and guitar, Caitlin Moss on drums and John Northup on bass, the millennial band members draw lyrical inspiration from the realities they witness in Los Angeles, the multi-hued, culturally diverse metropolis they each call home. Formed in 2012, the eclectic ensemble of musicians joined forces specifically—according to those who have followed them from the beginning—to create music and to consolidate their artistic impulses as dedicated agents of social change. Together, as artists with experience in various disciplines, they have developed songwriting workshops, drum circles, theatre classes, and youth-focused empowerment lectures which have been shared across LA County. As music and arts educators, they work primarily with young people from kindergarten to 12th grade. Collectively, they are committed to developing the next generation of music makers with the object of inspiring growth, enjoyment and healing. Since their formation four years ago, Cuicani has assembled a body of work that encompasses an innovative series of educational curricula and a repertoire of songs that have now been collected as a debut double album titled Now & Then. 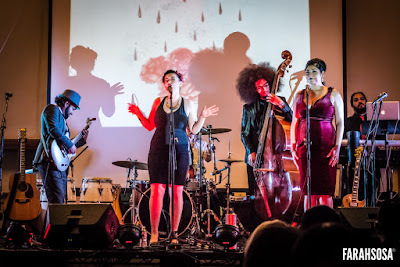 The unique blend of musicianship, stage performance and art as community advocacy was released on March 25th at a unique, interdisciplinary arts extravaganza and inter-community celebration held in the North East LA neighborhood of Eagle Rock. A 16-track double album, Now & Then is a product of Cuicani’s work in threedistinct studio sessions, says Veronica González, a spokesperson for the group. “The first one took place at Coney Island Studios under the supervision of Grammy-winning percussionist and engineer Alberto López, who plays with both Quetzal and Jungle Fire, two bands that have set the contemporary standard for the loosely defined ‘East Side’ musical renaissance,” says González. Quetzal Flores, a Grammy Award recipient and co-founder of the internationally acclaimed band that bears his name, oversaw the second studio session, she notes with enthusiasm. “For the last session, they booked 54 East Sound Studios and recorded with producer and songwriter London Parker McWhorter on the mixing board,” González continues. Now & Then, she explains, also represents two phases of the band’s career—early material makes up the first half of the album, thus the reference to “Then” in the album’s title. The second disc in the two-CD set, delivers more recent songwriting efforts, the music they are making “now.” The album, as a whole takes listeners on a blood-pumping journey through a range of world, soul, Latin, and Afro-Caribbean sounds that include reggae, dancehall, cumbia, timba, son, rock and blues. The songs are informed by themes of cultural identity, working-class struggles, community empowerment, heartbreak, love, and unity, while never veering far from a thread that is at once uplifting and upbeat. Now & Then opens with “They Say,” a rousing testament to the perennial, cross-border, trans-Atlantic allure of ska as a musical idiom featuring Sauza on lead vocals. The song is a paean to love and hope as antidotes to hardship and tragedy. It is followed by a rhythmic, reggae-inflected number titled “New Day,” written during a New Year’s Eve celebration in the months right after Cuicani was formed. The track embodies the excitement that accompanies the genesis of something new and promising. The second disc opens with a piece that harks back to old-school ’50s R&B and aptly dubbed “For Them Now.” The song is highlighted by compelling, soulful vocals provided by Martínez and lyrics that underscore the urgent need for more black and brown unity. Beltrán-Cuauhtin follows suit in this vein, riding the groove as she belts out the lyrics to “Mama,” an unapologetic, obvious soul song, with unmatched ferocity. The track is punctuated by environmentally conscious lyrics that argue for taking a stand against water privatization and corporate greed. “Free As A Dove” is a blues-rock anthem for rebellious hearts with the courage to break free from the constrictive restraints of stagnant relationships and societal shackles which limit personal freedom and growth. Now & Then closes with “Money,” a satin-smooth tune that unfurls like sweet liquid through Martínez’s vocal stylings. The song recommends we abandon the stress and pressure of life in pursuit of material gain for a more natural and cooperative and consequently happier, more fulfilled existence. The album release party, a sold-out affair which took place the Center for the Arts Eagle Rock, included an art installation and companion workshop that revolved around concepts of home as imagined by a multi-generational group of LA Chicana artists, among them: acclaimed altarista Ofelia Esparza, a widely acknowledged honorary madrina to countless East LA artists who embrace Chicanismo as an aesthetic exercise and an ethnic identity; her daughter Rosanna Esparza-Ahrens, a renowned artist, curator and arts advocate in her own right; and Mujeres de Maíz co-founder as well as interdisciplinary/multi-media artist Felicia Montes. The three were joined by a number of notable artists who fuse public and socio-political activism with personal aesthetics, formal concerns personal issues within in their work. “Entre Mujeres,” an all-womyn musical collaborative stemming from an album project titled Entre Mujeres: Translocal Musical Dialogues, developed by music scholar Dr. Martha González, performed a short set as a compliment to the screening of a mini-documentary on the making of the Entre Mujeres record.Gonzalez was born into what some have referred to as the first family of Chicano music in LA and is the front-woman for Quetzal, the band she co-founded with partner Quetzal Flores. The evening culminated with a rare, not-to-be-missed hometown performance by Quetzal which was then be followed by a rousing headliner performance by Cuicani, joined for individual tunes by several special guests, Quetzal Flores and Marisa Ronstadt being just two of the group's favorite collaborators. A natural extension of the artivist elders, legendary East Side musical pioneers and community organizers under whose guidance and leadership Cuicani members have blossomed and gained firm footing in an already fertile musical hotbed, the five artists who comprise the nascent musical outfit want to honor those who have encouraged, nurtured, inspired and educated them, suggests publicist Veronica González. “They are thrilled to share a vision and a musical legacy rooted in equality, humility, a commitment to social justice, respect for human rights, gender parity and unabashed humanitarian values,” she says. “The event was a stellar example of what can happen when artists gather to nurture and love one another and divest themselves of the music industry pitfalls that often accompany sudden success,” González observed.